The second session of the 13th Supreme People’s Assembly, held at Mansudae Assembly Hall in Pyongyang on September 25, 2014, appointed a new Vice Chairman and two new members to the DPRK National Defense Commission (NDC), the country’s supreme power organization. NDC appointments are an opportunity for Kim Jong Un to show off his authority. In this case, he replaced two people he had previously appointed to the NDC. NDC appointments are also a major opportunity for Kim Jong Un to make his own mark on one of the country’s major power organizations. Since Kim Jong Un came to power in December 2011, he has appointed over half the NDC’s Vice Chairmen and Members. 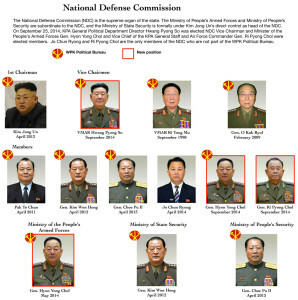 Personnel matters of the National Defense Commission and the Korean People’s Army’s (KPA) high command have been volatile since 2009. Of the 12 NDC Vice Chairmen and Members elected in April 2009, only two remain on the NDC. From 1992 to 2008, eight members of the NDC were replaced; in the past five years, 11 have lost their jobs. 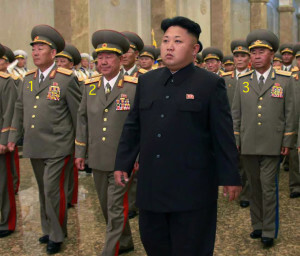 Within the top-tier positions of the KPA high command since 2010 there have been five Ministers and three First Vice Ministers of the People’s Armed Forces, four Chiefs of the KPA General Staff, three directors of the General Staff Operations Bureau and three Directors of the KPA General Political Department. The three men appointed to the NDC on September 25 have, in different ways, been part of these personnel shifts and proven they are political survivors. The three new NDC appointees—Hwang Pyong So, Hyon Yong Chol and Ri Pyong Chol—have some common traits. Hwang, Hyon and Ri have survived numerous personnel changes, turf wars and challenges in the aftermath of Kim Jong Il’s death and Kim Jong Un’s succession. They have all been active, core members of North Korea’s national security community in the Kim Jong Un era, placing them on the inside track of strategic decision-making and crisis management. All three are in their 60s, placing them in the younger cohort of the 2nd Revolutionary Generation (i.e. the Kim Jong Il Generation). They all have at least some limited experience of traveling outside the country and interacting with foreign political and military leaders. They all have some direct experience in economic affairs and activities. Finally, along with Kim Jong Un they were all elected to their first major positions in the Workers’ Party of Korea (WPK) Central Committee at the 3rd Party Conference in September 2010. Hwang Pyong So: Hwang is the Director of the KPA General Political Department, the political boss of the North’s military. In contrast to other top officials whose careers advanced gradually, his ascent to the top has been rapid. In 2014, Hwang was appointed to the WPK Political Bureau and the Party Central Military Commission, promoted to Senior Deputy Director of the WPK Organization Guidance Department, given the military rank Vice Marshal, and then after the SPA session, NDC Vice Chairman. On one hand, Pyongyang watchers view Hwang’s career advancement during 2014 with some trepidation. Since 2010, four senior officials have been elevated to the rank of Vice Marshal, appointed to senior command positions in the KPA and given top positions in the WPK. These four have all either been demoted or removed from office altogether. This raises the possibility that Kim Jong Un has promoted another fall-guy. On the other hand, Hwang enjoys close personal and political ties to Kim Jong Un. In contrast to other senior officials who have risen and fallen during the last few years, Hwang is not a holdover from the Kim Jong Il era. His appointment will lead to stability in the NDC and the KPA high command over the short-term and will probably stop the vertiginous pace of personnel turnover that has affected the DPRK’s national security apparatus since Kim Jong Un assumed the supreme leadership. Hyon Yong Chol: Hyon is the Minister of the People’s Armed Forces, the DPRK’s defense minister. This is the second time Hyon has held a position in the KPA high command during the last two years, having previously served as Chief of the KPA General Staff from July 2012 until May 2014. A former commander of the VII Army Corps in North Pyongan Province, Hyon Yong Chol and Kim Jong Un were promoted to four-star general (taejang) in the same September 2010 promotions order. Having been appointed to two high command positions in a short time, Hyon has been the KPA’s clutch player during personnel shake ups. An experienced hand like Hyon provides Kim Jong Un a certain level of continuity and allows him to move more efficiently in dismissing and appointing top KPA commanders. Ri Pyong Chol: Ri Pyong Chol is commander of the KPA Air and Anti-Air Forces (KPAF) and Vice Chief of the KPA General Staff. Since Kim Jong Un assumed power, nearly every senior commander in the KPA’s service branches and corps-level units has been replaced making Ri, KPAF commander since 2008, the last man standing. During 2014, Ri has attended over a dozen events with Kim Jong Un which demonstrates his access to the supreme leader. Ri also staged a large air show in May 2014, attended by Kim Jong Un and other members of the central leadership, in which KPA officers and commanders participated in flight drills. Of the three appointments made to the NDC on September 25, Ri Pyong Chol’s is the most notable. He is the first commander of a KPA service branch to be appointed to the NDC and the first member to be appointed from the General Staff apparatus since 1997. It remains to be seen if this extraordinary NDC appointment is because the KPAF has attained a prestigious status within the KPA or whether it is tied to Ri Pyong Chol’s relationship with Kim Jong Un.